I seem to have finally resolved all my technical issues with my monitor and software so that I can consistently get good results from my processing. And I’m starting to get my mojo back, thanks to joining a photography club and also setting up a weekly challenge for myself. So I’ve started going back through some of my old raw images, looking for new material to play around with while I teach myself some of the features and hidden (to me) tricks of PaintShop Pro X7, Topaz plug-ins, and Lightroom. I’ve been watching quite a few YouTube video tutorials, as well as sitting in on live webcasts from Topaz for their products. 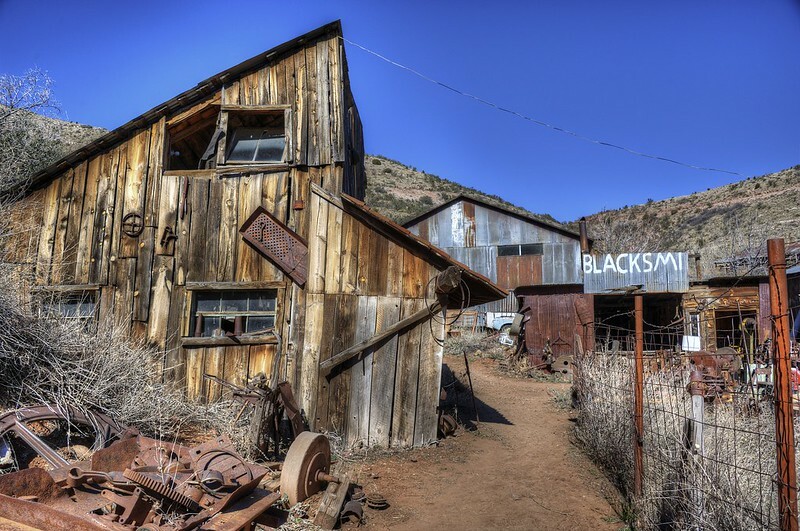 Today I pulled out some brackets from our 2011 weekend trip to Jerome, Arizona, where we toured the old Gold King Mine. It’s a veritable treasure trove of photo ops, and I highly recommend that you put it on your photography bucket list. I processed this image first in Photomatix Pro 4.2 to merge the three brackets into an HDR image. I then did some further editing in Paintshop Pro X7, using some of the tips I’d seen on some YouTube videos today. For instance, I learned that the new X7 version of PPS has the “Magic Eraser” tool, which is a content-aware tool for removing things like dust and flare spots quickly and easily. It’s much easier than the “Object Remover” tool that I had been using. It really made a difference in cleaning up this image! I really like this image, although I still might go back and try to remove that power line–it just seems to mock me!! Oh, yeah, I also spent a little money online this week to pick up some other things that I’ve been putting off purchasing for my photography habit. I finally bought the cleaning solution and swabs to clean the sensor on my Nikon D700–so tired of seeing the spots in the sky on all my landscape shots. And this week I used my last bonus from work to order a Wacom tablet to make some of the editing tasks easier–things like fine selections for masks, for instance. I’m really looking forward to getting my hands on that tablet and learning how to use it. Tonight, I’m just fooling around with some old shots that I hadn’t processed yet. 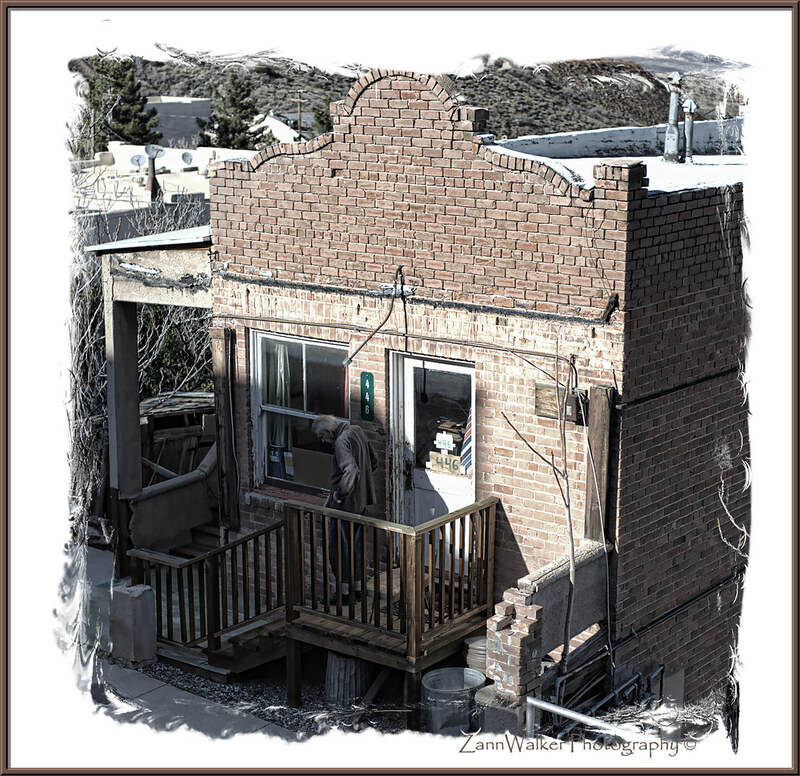 I found this one that I took in Jerome, Arizona back in March. I was standing on the balcony of our hotel room in the early morning, looking down the hill at the old houses and shops, when this old man came out of his house and started shuffling down his steps. The way his shoulders were hunched against the cool morning air, he sort of resembled all the old buildings hunched against the side of that mountain, hanging on for dear life, trying to stay out of the wind long enough to get a little older. I intentionally desaturated this image somewhat, and I used Topaz Adjust to tease out the detail in the shadows. 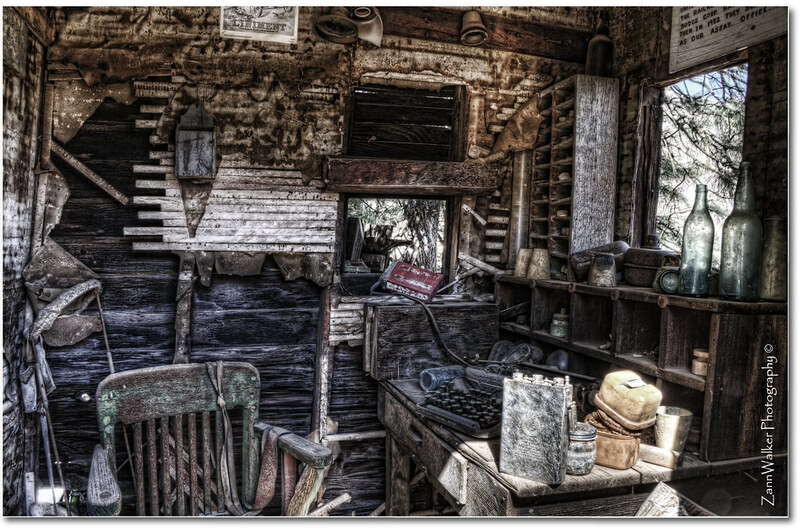 I played around with some of the presets in Paintshop Photo Pro to rough up the edges and add a border. Probably should have just left it alone, but that’s how you learn, right? For tonight’s post, I’m pulled out some unprocessed raw files from our last trip to Jerome. 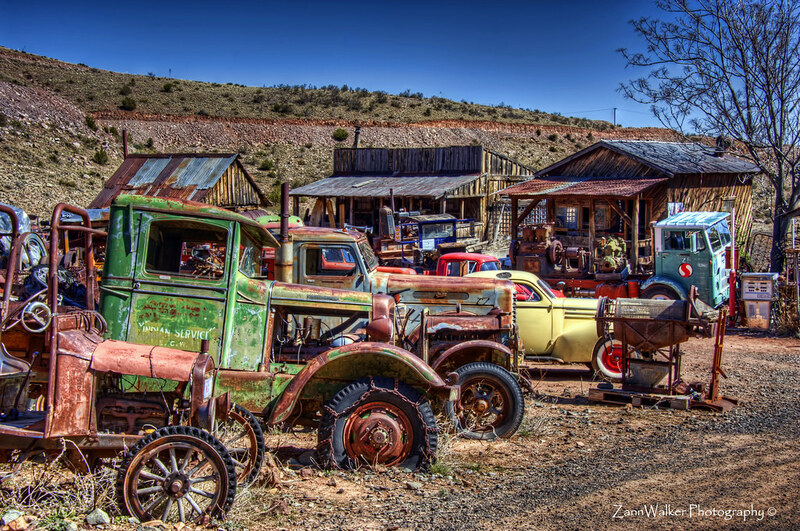 Here’s a shot of one of the old abandoned cars that they have on display at the Gold King Mine ghost town. I wish I could tell you what model year this Studebaker is, but I’ve never really been that good at identifying automobile models. I was more interested in the paw prints in the dust on the windshield. 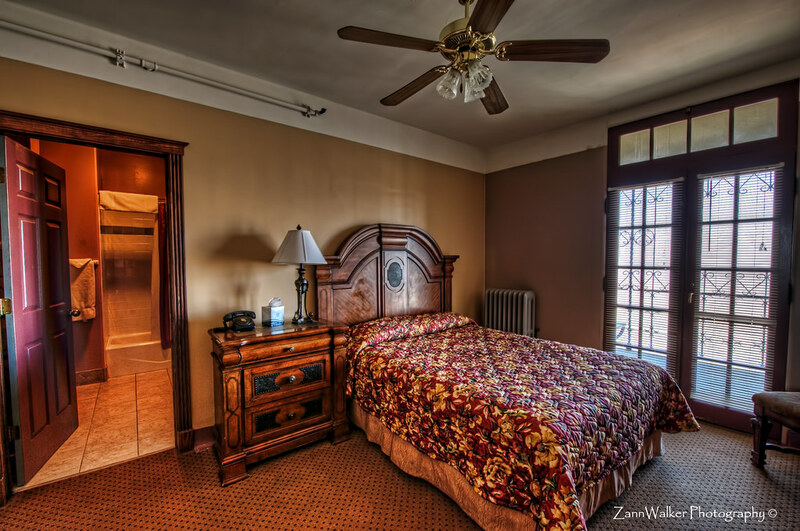 A few posts ago, I presented some images of the interior of the historic Grand Hotel in Jerome. I’ve also shown you their still-operational Otis elevator. 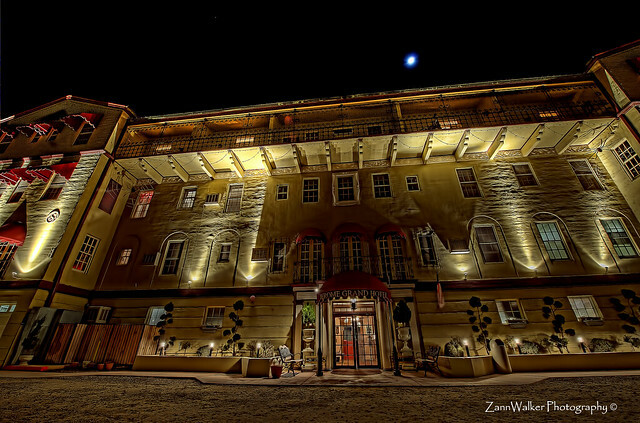 As promised, tonight’s post presents a few images of the exterior of the hotel, with a few processing twists. I still have lots of great shots from Jerome that I’ll probably play with in the coming weeks. But we’re heading to Sedona tomorrow where there are always great photo ops at every turn, so I’m sure my inventory of images will be overflowing by Sunday evening. 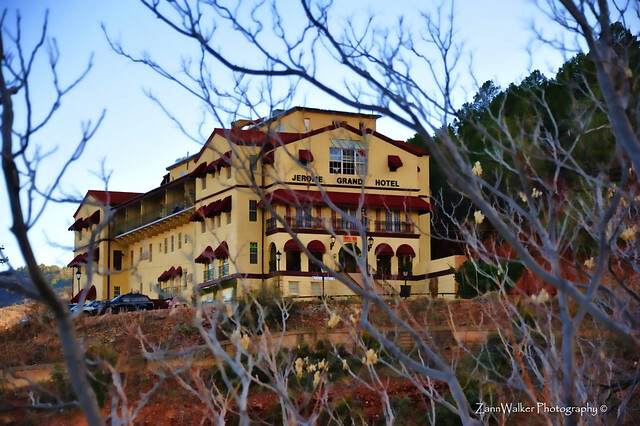 Yeah, I know I said my next post would include images of the exterior of the Grand Hotel in Jerome, but I just had to sneak this one in first. I just processed it last night, and I really like how it came out. This is one of the many “collections” (i.e. 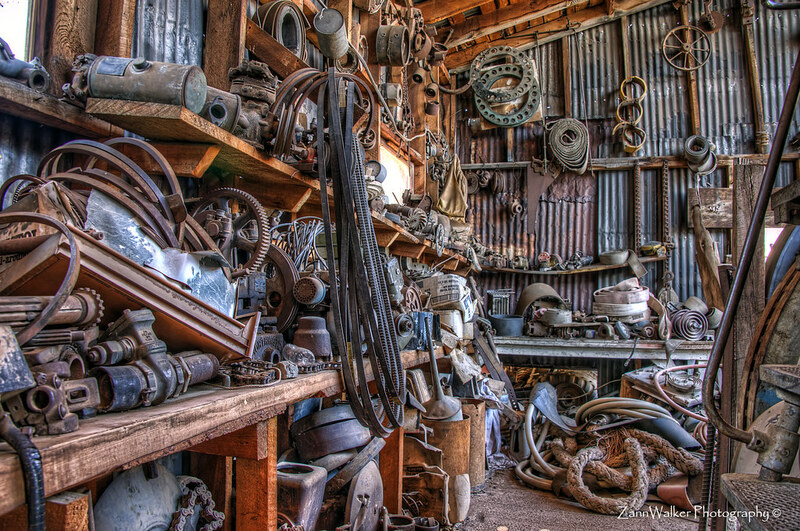 “piles”) of old equipment from the Gold King Mine ghost town in Jerome. 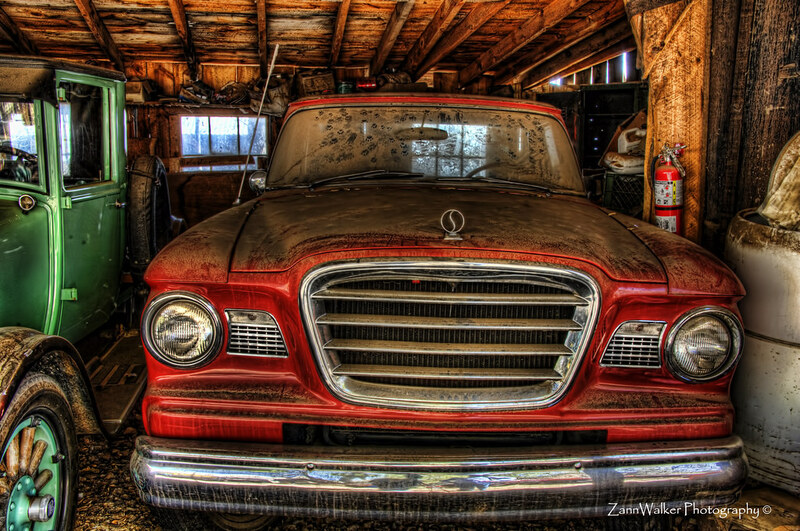 All the various textures, colors, rust, and light angles just cry out for an HDR treatment. I love all the little details, even the incongruous ones like the empty plastic water bottle…I don’t think that came from the miners. As I’ve mentioned before, we elected to stay at the Jerome Grand Hotel on our last trip, for a couple of reasons. First of all, the hotel is located at the top of the mountain-side town, so it has a great view of the town and the surrounding valley beyond. 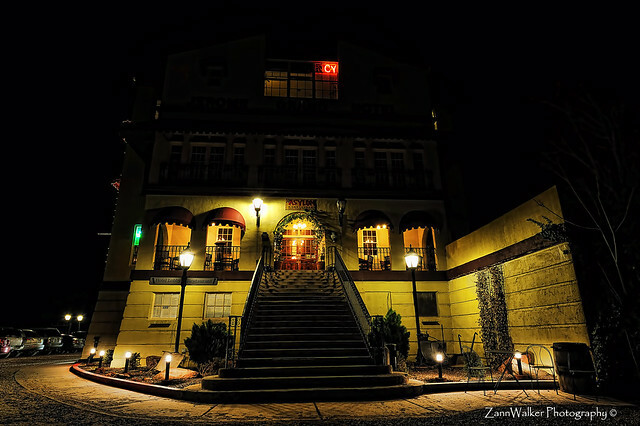 But the hotel also has a lot of history and mystique about it, and we love a good story. This Spanish Mission style building, constructed in 1926, started out as the United Verde Hospital, opening January, 1927. In 1930, it was written up as the most modern and well equipped hospital in Arizona and possible the Western States. The Hospital was closed in 1950 as the mine operation was being phased out. The building stood unused for the next 44 years until the rehabilitation plans started in 1994. 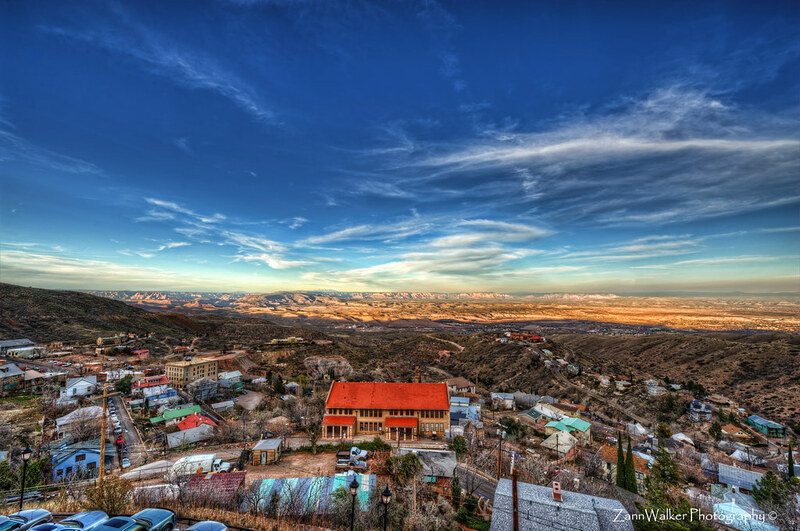 The building is one of the highest public structures in the Verde Valley, (5240 Ft.). 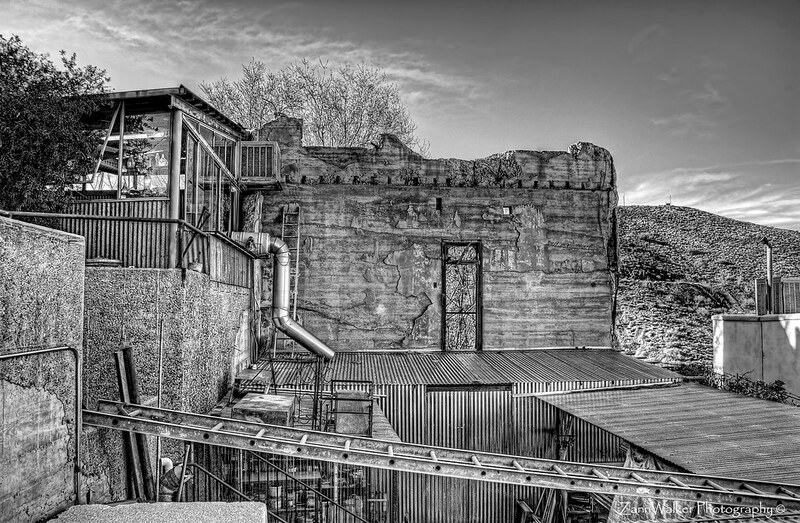 As the last major building constructed in Jerome, the building was not only to boost the pride of the town in its classic design, but was built fire proof and able to withstand the blasts of up to 260,000 pounds of dynamite set off by the mine and sometimes felt as far away as Camp Verde, a distance of 20 miles. How this 30,000 sq. ft., five level building of poured in place, reinforced concrete, was constructed on a 50 degree slope is an engineering marvel even by today’s standards! Purchased by the Altherr Family in 1994, from the Phelps Dodge Mining Corp, the restoration and rehabilitation was started. Having been closed for 44 years, there had been no changes to the original building except for the enclosure of the roof top deck in 1929, The building has withstood the tests of blasting as well as the tests of time. 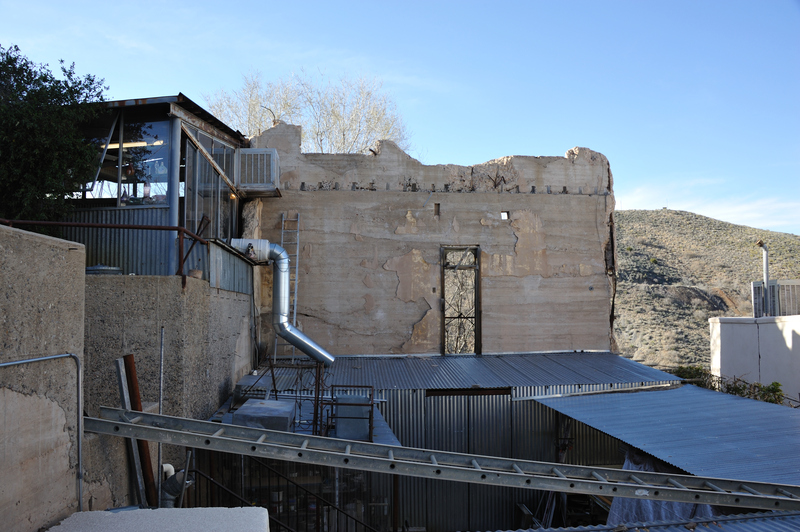 This has to be one of the best preserved buildings in Arizona and extreme measures have been used to protect the interior and exterior integrity. Our balcony room was beautifully decorated and very comfortable, with a few quaint touches like the old telephone with no dial (you just pick up the handset and you’re automatically connected to the front desk), the steam radiator, and the transoms over the doors to let the breeze blow through. The bed was very comfortable, the bathroom facilities were modern and functioned perfectly, and the balcony was a delightful space to sit with a glass of wine and watch the sun go down (while shooting brackets, of course!). We truly enjoyed our stay at the Grand Hotel, even though we didn’t get to meet any ghosts while we were there. The staff was friendly, the lodgings were comfortable, and the view was unbeatable. On my next post, I’ll share some images of the exterior of the hotel…watch out for spiders!